The University of Louisville is pleased to offer a Computer Purchase Program for eligible faculty and staff for personal use. This program allows the total purchase of a computer, tablet and/or eligible equipment (up to $1,500) to be payroll deducted for either a 6 or 12-month period. To participate, eligible computers, tablets and equipment must be purchased through the University of Louisville Campus Store. House staff and temporary lecturers are not eligible to participate. 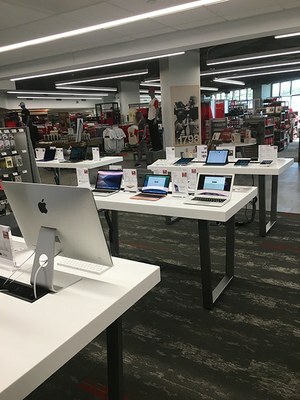 The computer purchase program is available for in stock computers and tablets at the UofL Campus Store, located in the Student Activities Center on Belknap Campus. The campus store carries a wide variety of computers and Apple products. It is recommended that you view available options prior to submitting your application, so you know what is available to you. All products are available online via the UofL Campus Store website. However, please keep in mind that to participate in the computer purchase program all purchases must be made in store. It may take approximately 10-12 business days for Apple online products and 3-5 business days for non-Apple products. If you find a computer online on the campus store website that you are interested in that has a ship to store option, take the details with you to the store to order. In addition to computers and tablets, purchases can be make for computer equipment, such as printers and keyboards. See a complete list of eligible expenses. Use of the $1,500 can only be used at one time. No additional expenses can be charged until the initial purchase is paid in full. Please make sure you have included all additional equipment you desire at the time of your initial purchase. Participate in this payment program and purchase a computer through the UofL Campus Store by following the steps below. Terms & Conditions apply. Fill out a Computer Purchase Program application. Once your application is approved, you will receive an email from Human Resources. Take the email, along with a photo ID, to the UofL Campus Store to select your eligible computer/tablet/equipment. Show the email and your ID to the campus store staff at the time of purchase. You must make your purchase at the UofL Campus Store within 30 days of receiving approval. Payroll deductions will typically begin the month following your purchase. Please refer to your approval email for additional details on the payroll deduction payment plan. How will I know my application has been approved? You will receive an approval email within 5-10 business days of the submission of your application. Can I use this program and purchase at another store (i.e. Best Buy, Amazon.com, etc.)? No. This program is setup specifically for the UofL Campus Store. In order to use this benefit, you must make your in-store purchase at the Campus Store located on Belknap Campus at 2100 South Floyd Street, Louisville, KY 40208. Phone at 502-852-6679 or email books@louisville.edu. Do I have to spend all of the $1,500 to purchase a computer? No. This program provides you the opportunity to have up to $1,500 payroll deducted. Any money over $1,500 will be due at the time of the purchase. Any purchase of $250 or less can only have payroll deduction for six months. Yes. You must arrange payment with the Payroll office. What products does the campus store offer? The Campus Store currently offers Apple products in-store. The Campus Store also has Technology Partner Sites on their website for Apple, Dell College Store and Lenovo Online Store. You may view these options online and then go into the Campus Store to have them order for you. They will not be able to order any online only products (web exclusive, online only, web only, etc.). Purchases cannot personally be made by the employee online, you must go into the store to have the Campus Store purchase on your behalf. What if I need to return a purchase? You must return within 30 days and it must be unopened. Opened merchandise cannot be returned. Can I use the Computer Purchase Program more than once? Yes. As long as all previous purchases are paid in full. You must submit a new application each time. Can I purchase more than one item at a time? Yes. You can use the available $1,500 for any eligible expense. For example, you can purchase a tablet, printer and keyboard at the same time. When will I receive a deposit for the $1,500? You will not receive any deposit to your bank account for this program. Your purchase will be directly billed to Human Resources and a Payroll deduction will be setup to come out of your paycheck, approximately one month after your purchase. Can I purchase software through this program? No. Software can be purchased through iTech Xpress at a discounted rate for faculty and staff, which is not offered through this program. Payment would be required at the time of purchase. You can call (502) 852-4943 or send email for more information.